On Tuesday, June 20, 2017, management and staff representatives of Sun Island Bali Group along with members of welfare committee departed to Banjar Angantiga—a remote village in Petang, Badung, Bali—for the company’s annual charity program. For the charity program in 2017, Sun Island Bali sponsored a house renovation to one family in Banjar Angantiga. Furthermore, the group also distributed donations of charity goods to five families who live in poverty and those with special needs. Donations in form of livestock, mattresses, and basic household needs were distributed directly to the families. Meanwhile, donations in form of second-hand clothes were handed to the local authority to be distributed more evenly. This annual charity program is conducted as a part of the group’s corporate social responsibility. 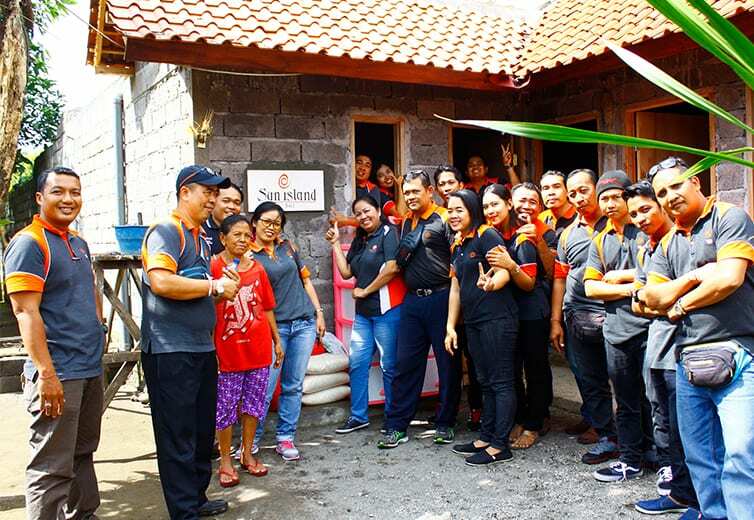 The management of Sun Island Bali Hotel Group is committed to supporting the local community through various activities, such as the donations and house renovations. In years to come, Sun Island Bali will continue to contribute to a wider scope in the community. Below are some images from the charity program. Sun Island Bali Hotel Group is a privately owned hotel chain that manages hotels, villas & resorts located in Bali’s most prime locations. Sun Island Bali group has run and managed Sun Island Boutique Villas & Spa, Seminyak; White Rose Kuta Resort, Villas & Spa; Sun Island Hotel & Spa Kuta; Sun Island Hotel & Spa Legian; and the latest, Sun Island Suites in Goa Gong, Ungasan. Each hotel or resort has a unique setting, with a blend of authentic Balinese heritage and Western contemporary designs, well equipped with outstanding facilities and exceptional service to ensure guest satisfaction, exclusivity and privacy. Sun Island Bali: Fun, Your Way!